I made a zillion of these and then gave most of them away. I was in one of those moods. 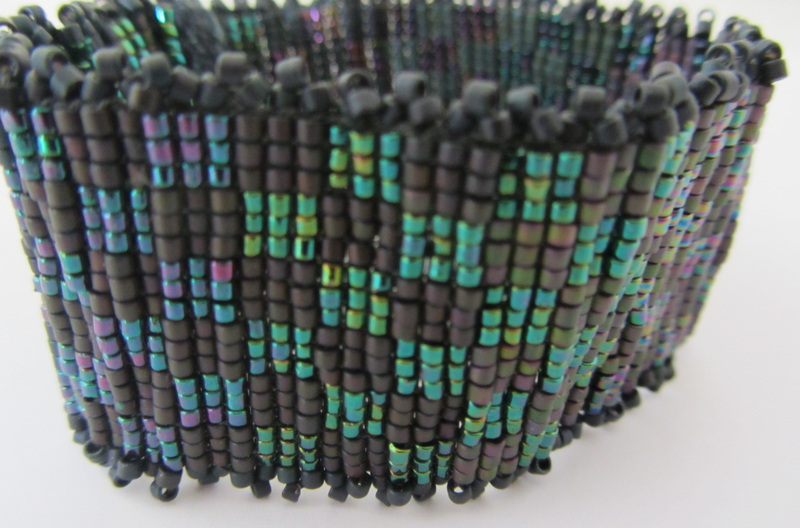 This bracelet weaves up very quickly. 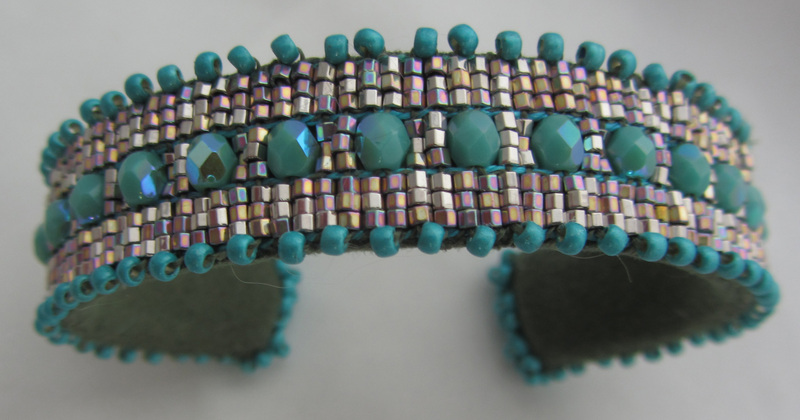 It probably takes longer to finish (attach to cuff and embellish) than it does to weave. 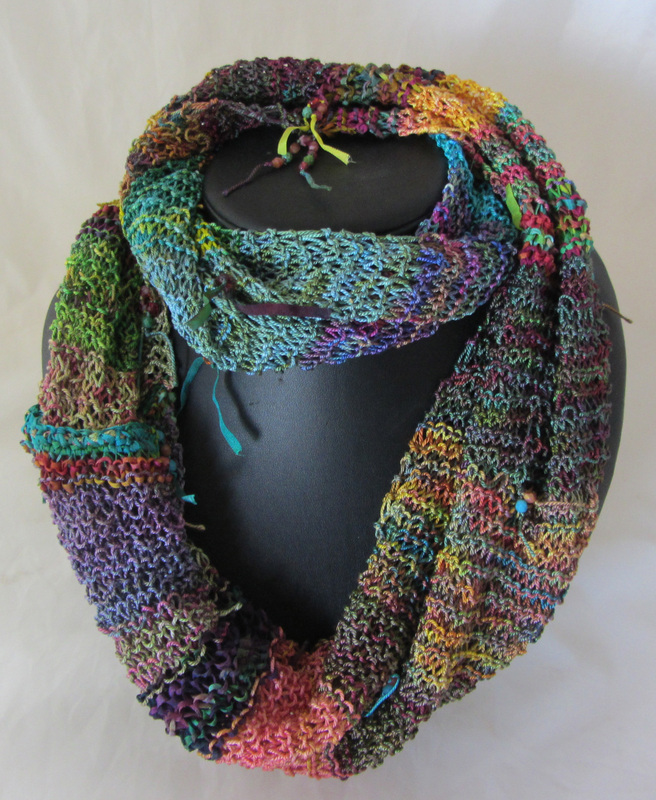 I would say total time to weave and finish is about two and a half hours, which makes it a “not-slow project” so great for those of you who have a lot of gifts to whip up for girls/women this holiday season. 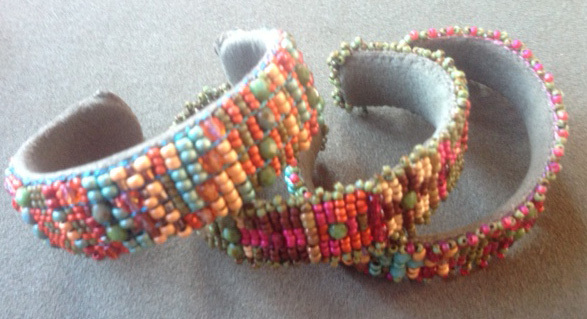 The kit, which I haven’t put together just yet (give me a day or so) will include enough materials to make two cuffs. Below are two examples. 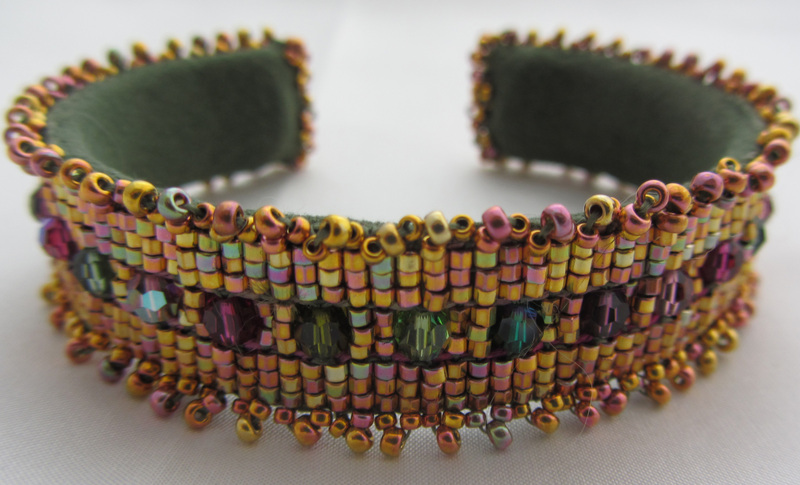 One without embellishment beads along the edge and one with. 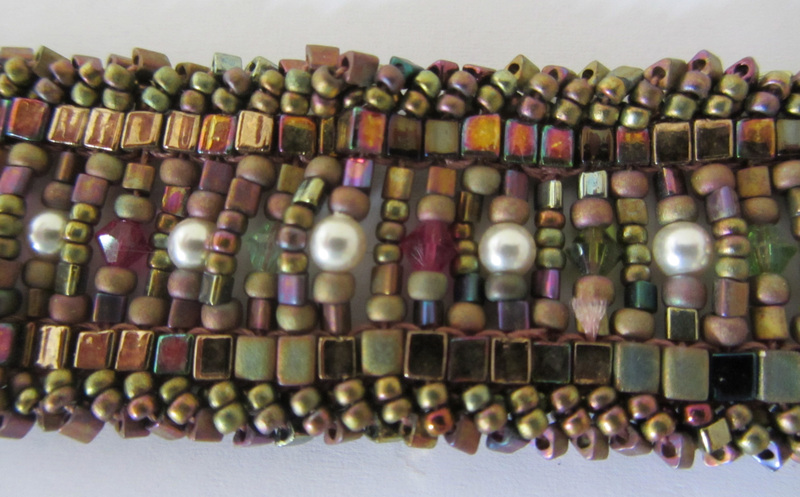 Obviously, the one without embellishment beads will take less time to finish. I like them both. 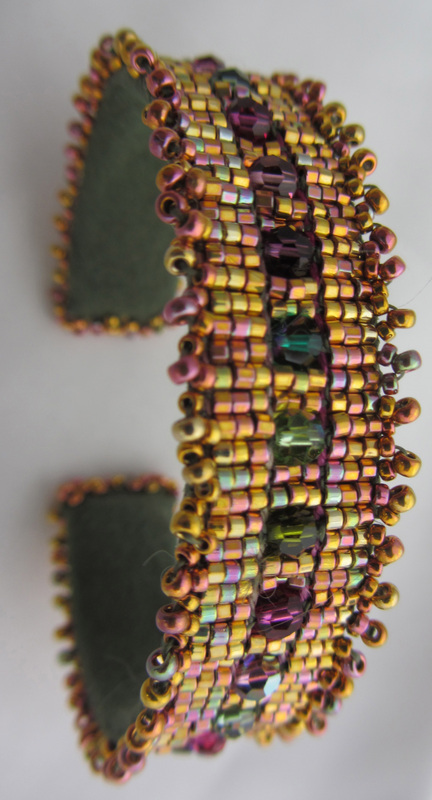 If you are not going to be embellishing with beads along the edge, you need to be very careful with stitching the beaded piece to the cuff. In any case, once on a wrist, those stitches will barely show but the cuff will not always be on someone’s wrist and you want it to look good then too. I have been playing (slowly) with hand painted silk. The eyeglass case, which is still on the loom, is now not wanting to be an eyeglass case. More about that tomorrow when I take it off the loom. To find the silk go to: http://www.mirrixlooms.com/store/silkandgoldkit24.html That’s the big pack and best deal if you want to make a larger piece. The first strip of silk is done. The other, almost done, is still on the loom. It’s hard to fail. Use any color of our hand painted silk in any order and it will be just right. 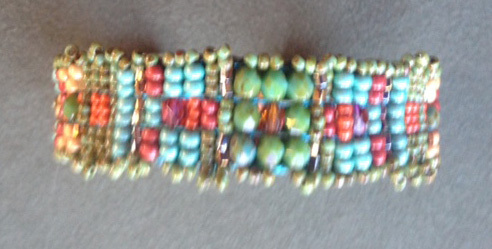 I added a few rows of beads here and there. 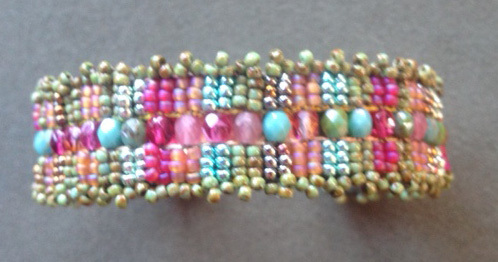 The sett was 14 ends per inch, so I used size 11/0 beads. 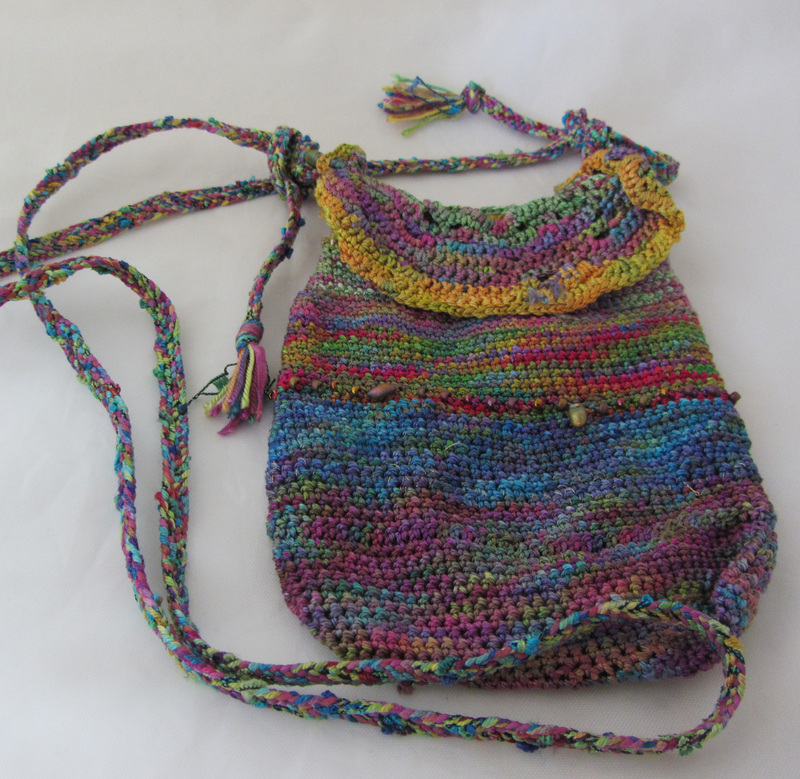 I crocheted this purse. It was actually a piece I made many months ago. I had made a bunch of these, but is the only one I kept. 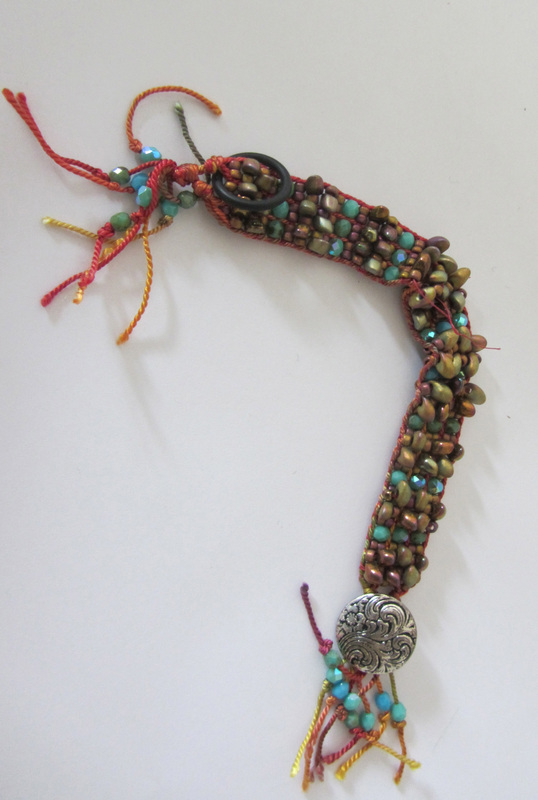 I added a row of magnatama beads and finished it with a braided strap. Number of hours to make? Who knows, but quite a lot. I wasn’t counting. Now for the embroidery. This one you might have seen before. It probably took about sixty hours to make and my hands did get sore doing it so I had to take many breaks to do other things. I think the creation time spanned about eight months. 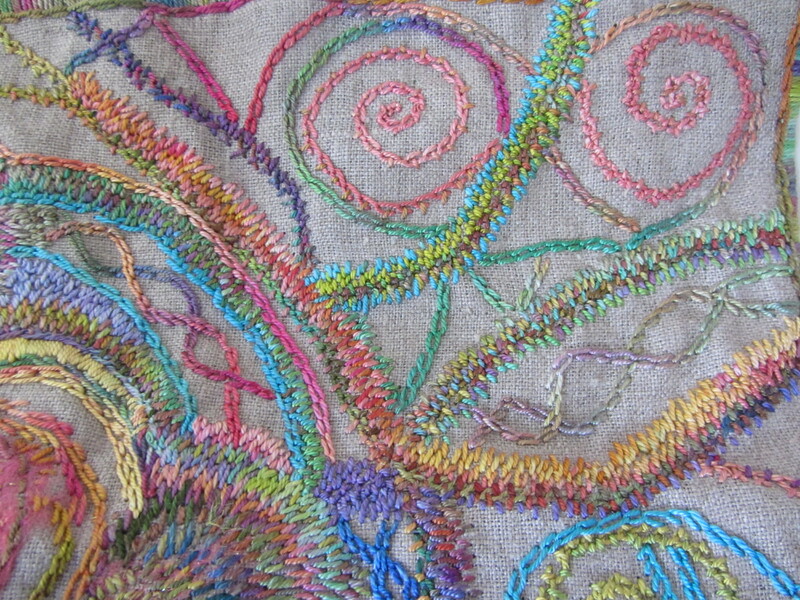 What follows are details of another embroidery I just finished. This one took even longer. But at some point I knew I was finished. I have two more that are almost completed. And then there is the knitted scarf (a Christmas present). 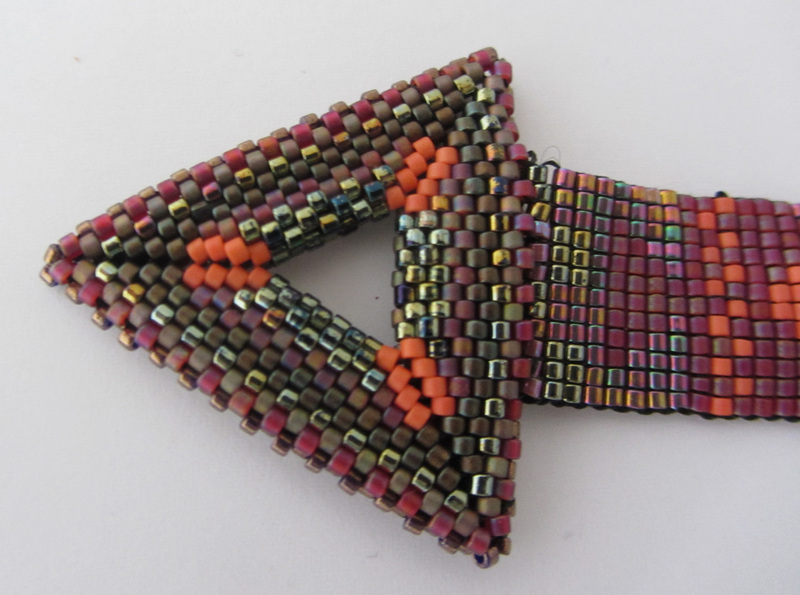 Whenever I joined two colors, I tied an overhand knot and strung crystals or porcelain beads on the thread ends. It was a great way to nicely hide those ends and add some interesting accents. I am going to start off this post the way I originally planned to start it which is: Looking for a quick and easy project to give away as a gift, something you can make in an hour or two and make a whole bunch of? Well, then this project is NOT for you . . .
That’s the way this post was supposed to begin, but now I am forced to digress madly. Recently, my job at Mirrix has been to make things. Elena thinks I should be designing projects every waking moment (in between the basic stuff of running Mirrix). If she had her way I’d be designing a new kit every other day! But am I complaining? I wrote down a bunch of our ideas and then while stewing about them I randomly decided to weave a long strip of hand-painted silk just because I wanted to. 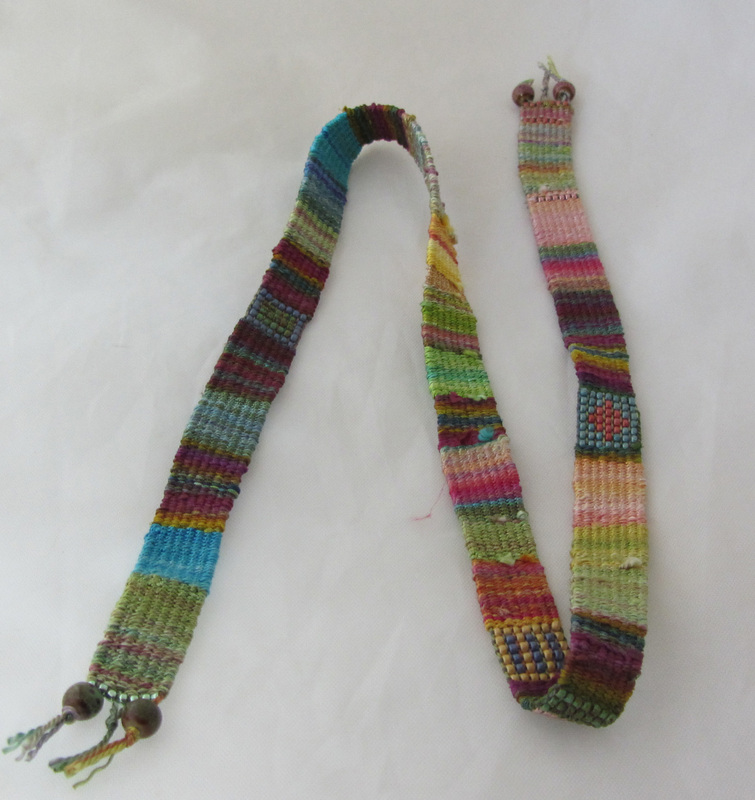 In fact, it will be two strips because I wanted to weave it on the eight inch loom, I wanted it in my lap sometimes and I didn’t want to use the loom extenders with the 12 or 16 inch loom because I wanted that “in your lap intimate” experience. 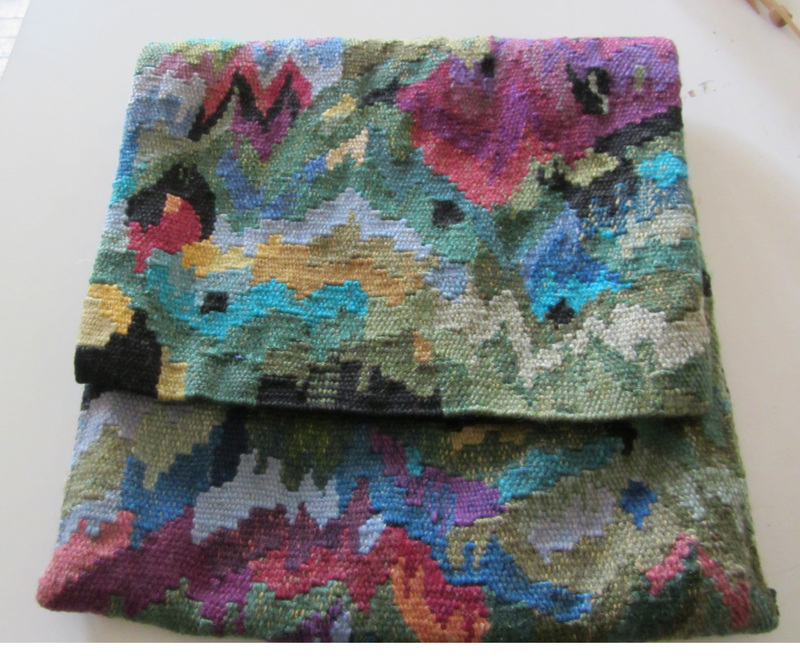 Even before I started weaving the strip I realized I could use it for a strap for this “failed” tapestry that became a purse but whose strap had gone missing. I don’t think it was a very good strap but the purse . 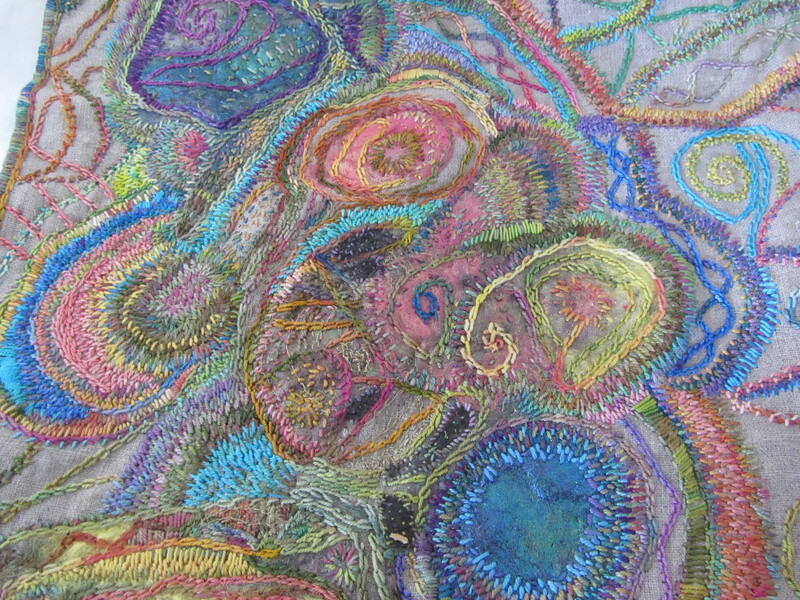 . . well, as I said, it was a failed tapestry but it was one intricate piece of tapestry. Not the kind of thing you would ever weave to make a purse. Oh, darn, now I have to photograph it. Wait a minute while I do that. 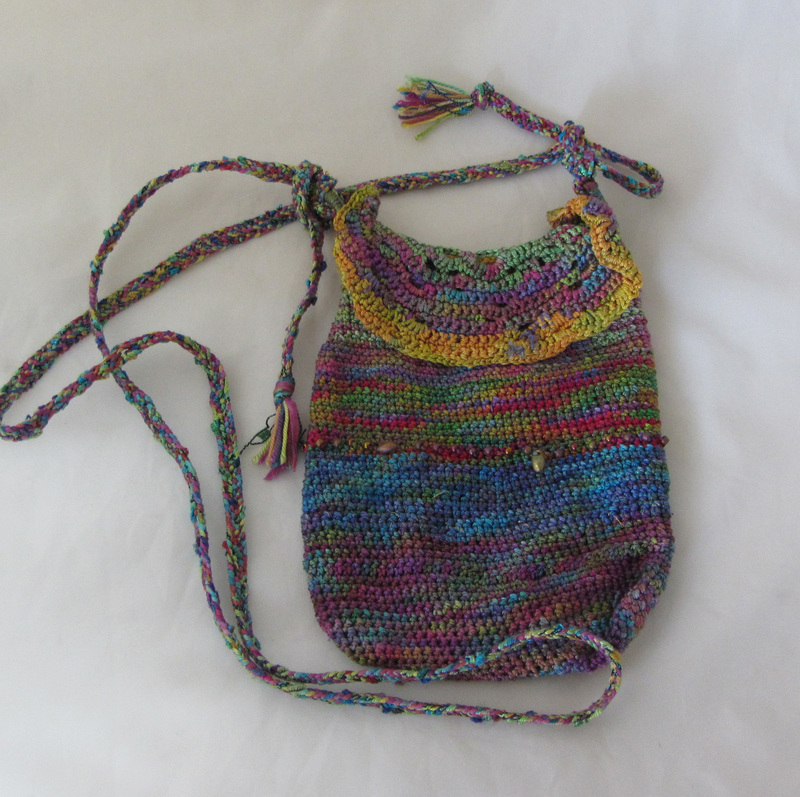 Okay, just took a couple pictures of the purse (and please pardon my photographs . . . my photo tent is officially dead and I am waiting for the new one to arrive. . . so it’s hard to get the light correct but I am too impatient to wait for the ten to post this blog post!) . . . This is the front. I think the tapestry was going to be a garden of sorts. 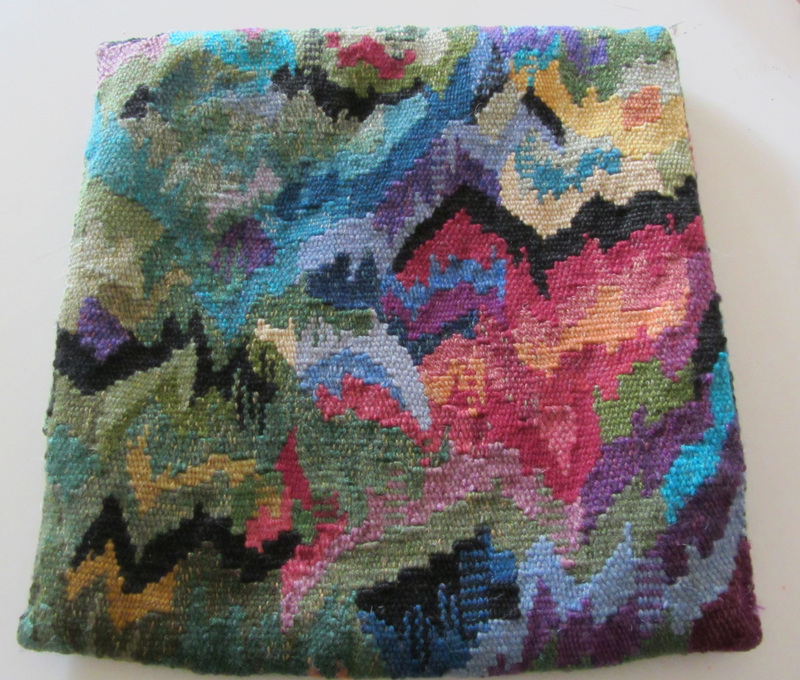 It was a very long time ago that I wove it and I only just discovered the purse hiding underneath a pile of tapestries that hadn’t met their goal. I didn’t use the shedding device. It’s not done yet, so I should put that in the present tense. 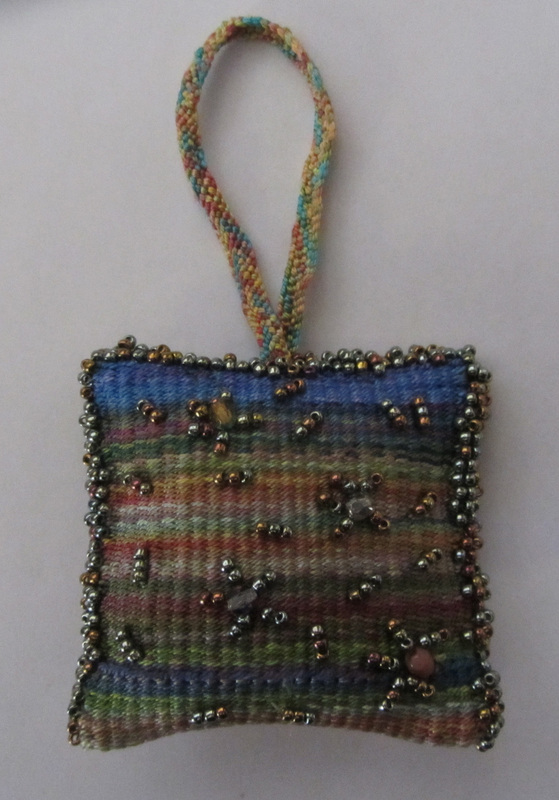 In any case, I needle weaving it because I wanted to feel that very rhythmic movement of under and over with a needle. There is something very primal about that. But I had promised Elena I would come up with a Christmas ornament, which leads me to another digression because she asked if I had every made one before and I replied: “Yes, I made one for the White House Christmas tree when Clinton was president.” I think she was a little surprised by that answer. The deal was, members of the NH League of Craftsmen were asked that year to make an ornament for the White House Christmas tree, so I did. I have no photographs of it and I can’t even remember what it looked like. But I do know I made it and I do know it hung on the White House Christmas tree for at least one season and now is probably buried in a box somewhere. 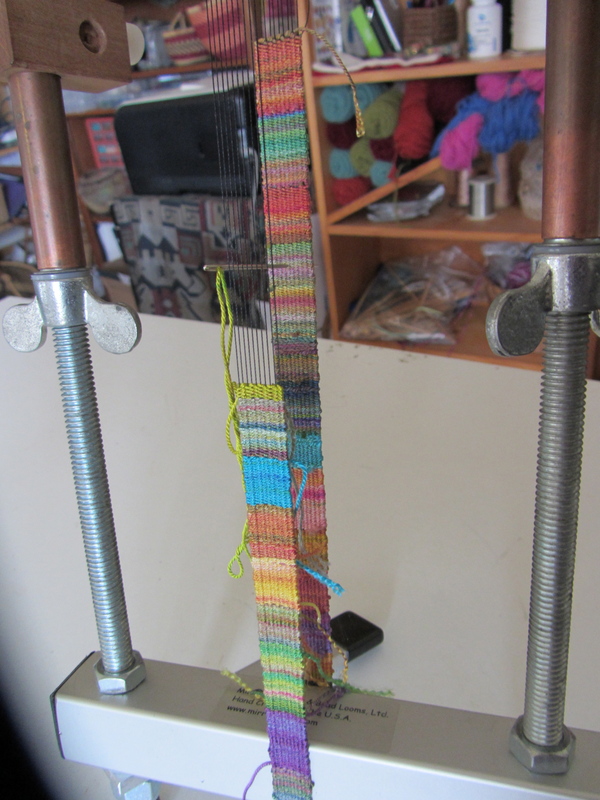 After we spoke I warped an eight inch loom with shedding device. The warp spanned about two and a half inches. The idea was to weave a five inch strip and then fold it over. 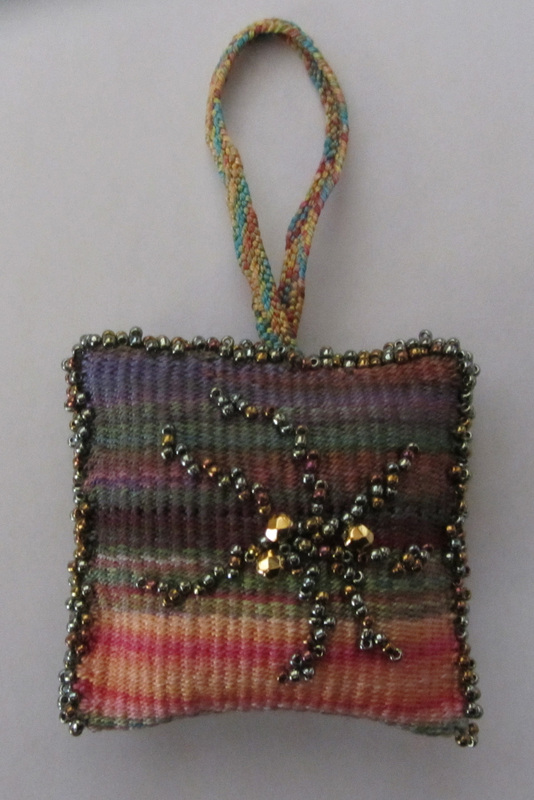 Elena wanted me to weave in some standard Christmas image, which I knew I would not do and she knew I would not do! 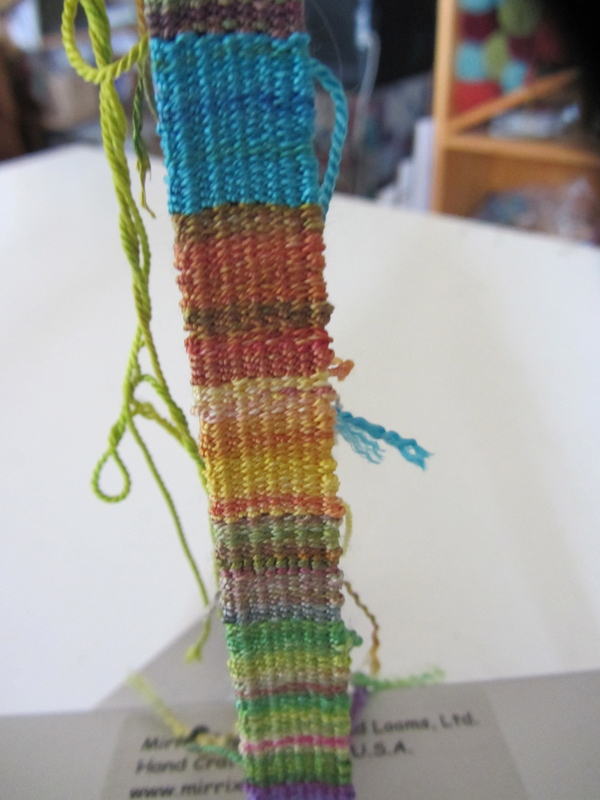 I loved weaving this piece, but before I even show you the pictures, I need to return to my original theme: Slow art/craft. After I wove the ornament I said to Elena: there should be something called “slow craft.” I thought I had just made up a new trend and then this morning I found out courtesy of the internet that indeed someone got there before me. Well, in reality it is an old theme. It’s the theme of tapestry weaving essentially. I mean, you just can’t rush a tapestry and if yo are sitting there counting your hours while you weave because you want to actually make money by selling it someday . . . forget it. Tapestry isn’t like that. I think there are two ways to approach craft/art, whatever you want to call it. There is the quick easy approach. The “I want to make a dozen of these things to give to friends and family at Christmas or to sell at the local craft fair or even in some high end gallery . . . the point being, the final object becomes almost more important than the journey. Sure, you may still have fun making it, but that is not the entire goal. With my strip though the goal was to enjoy making it. The goal was not to rush. The goal was the experience itself. Hence the thought “slow craft,” came to mind and clearly it came to other minds as well! I decided the Christmas tree ornament was going to be a slow craft too. I wanted to play with my hand painted silk. I wanted to see how it would weave up in a wider strip. Before I folded the piece together, I embellished each side. 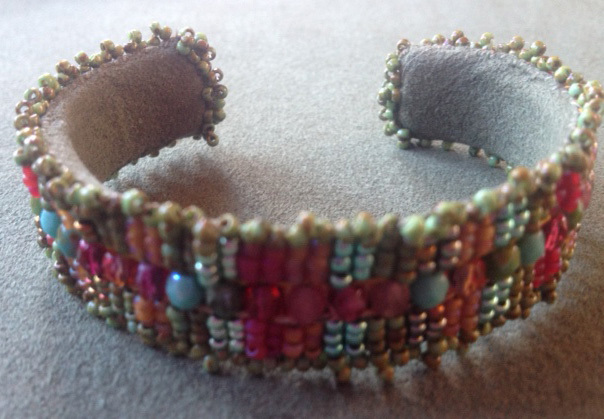 I then sewed up the sides, embellished with beads, added a braid to hang it . . . eight hours later I had my “slow craft” Christmas Ornament. I imagine I will only make one because my next project is to make a “slow craft” eyeglass case, again out of hand painted silk. In short, I am on a slow craft adventure. I have done my time making work to sell in galleries. 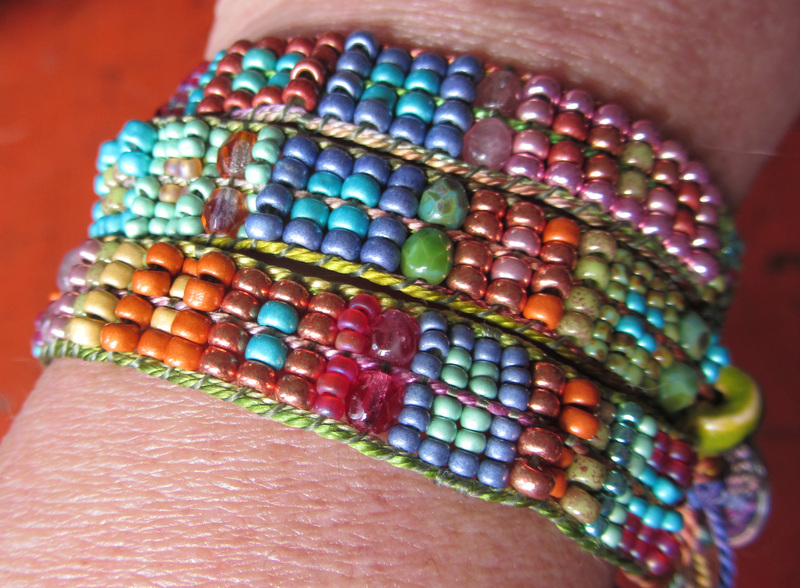 I know I owe several wrap bracelets to one gallery and even though I love making them, I don’t know if I am in the mood. I am in the mood to slowly and patiently weave row upon row of hand painted silk and then turn it into something that can be used or seen. I want the experience itself. And when you want that, you often don’t even want it to end. I always mourned the finishing of a large tapestry. What would be next? My life had been somewhat regulated by this constant theme of a large tapestry in progress and then when it was done I had to find something to replace it. So . . . slow craft, slow art. Even if I didn’t make it up, I am going to be talking about it a lot. 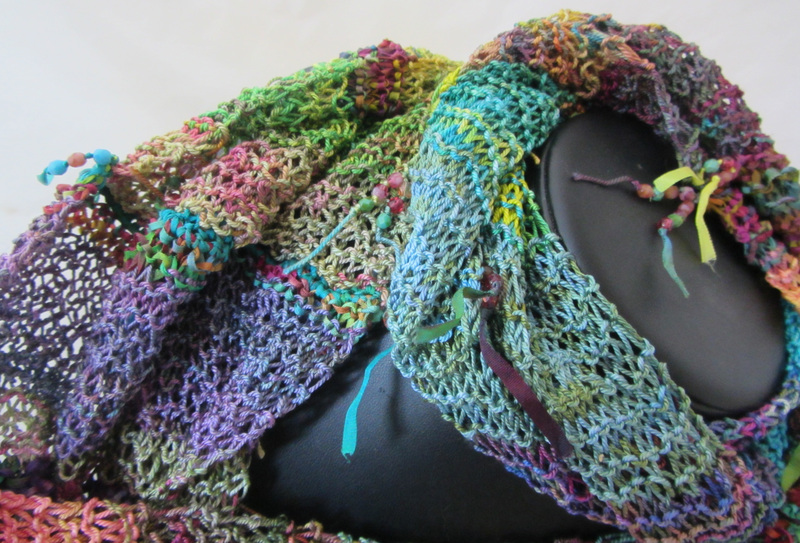 Next post is going to be about my “slow scarf”. 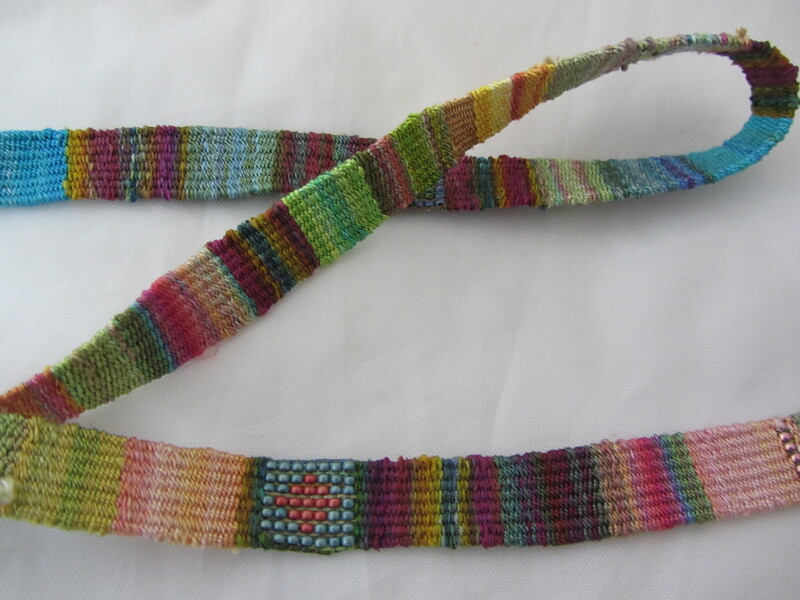 I remember really enjoying weaving this piece. 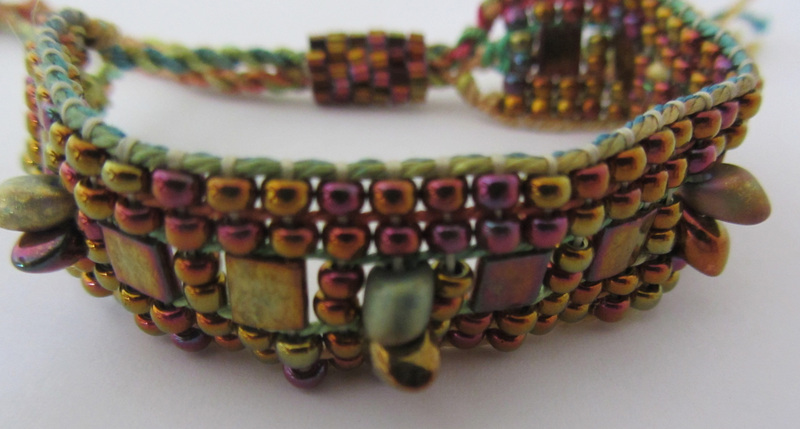 I made piles of 11/0 Delica beads in colors I thought might dance well together. 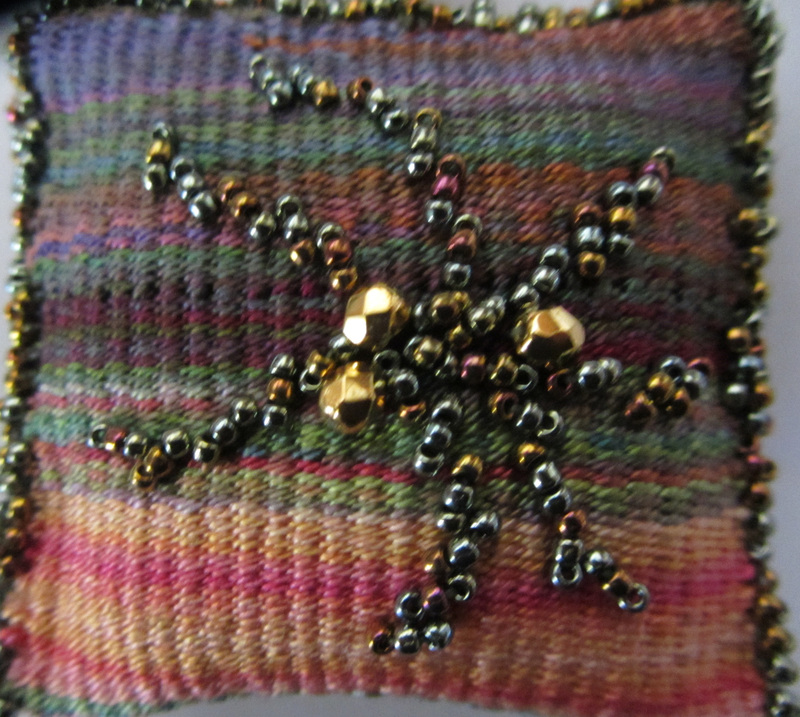 Then I just wove various designs with these colors. I had twelve spaces (because there were thirteen warps) to play with. It’s amazing how many designs one can managed with just twelve spaces and bunch of colors. I folded the button end over and sewed it to the back of the piece to disguise the warp ends (which were tied with overhand knots). I buried those ends under the fold. I then made a peyote tube and attached a tube to it for the button. 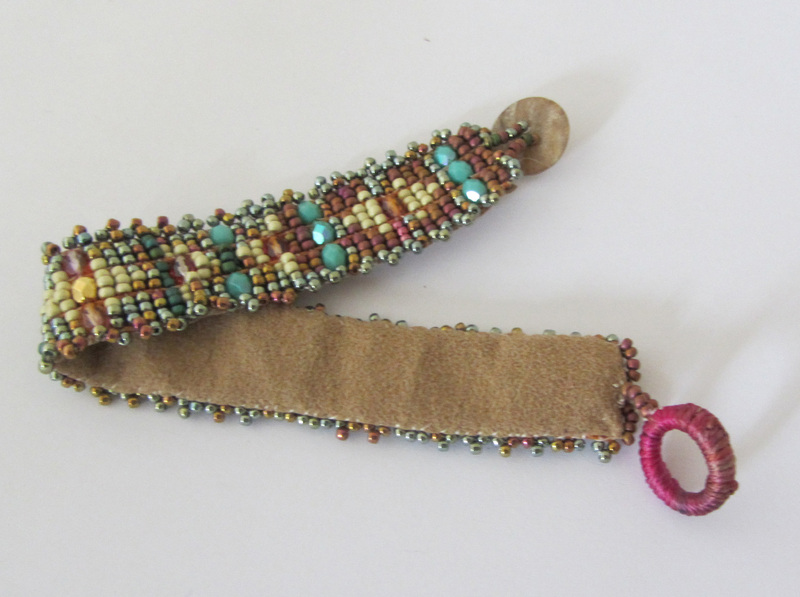 The triangle (which was made with a combination of peyote and herringbone stitch) buried the other end of the bracelet since it is actually two sided. 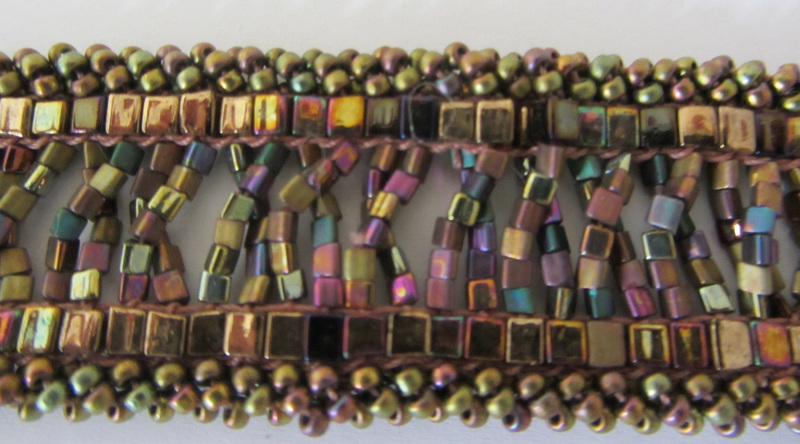 I combined matt finish beads with metiallic finish beads so that the individual colors stand out. I stuck an interesting crystal to the end of the peyote tube. I don’t know if I could make that triangle again, but I sure do like the look! 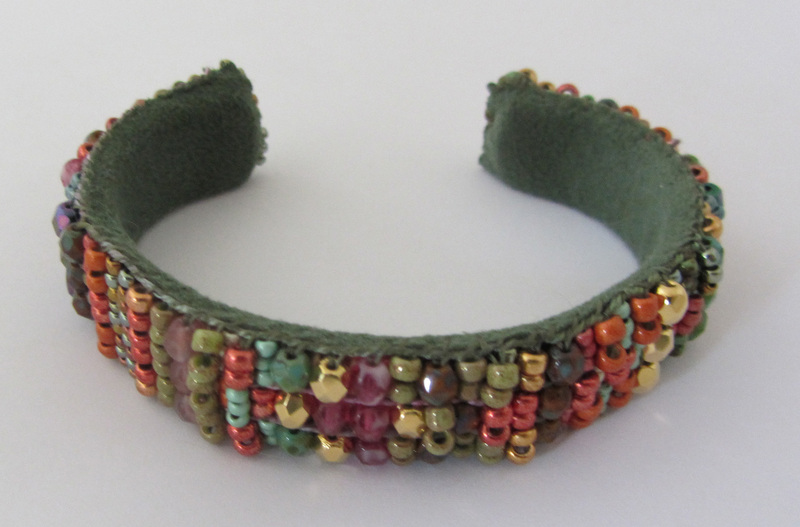 This next little gem is a one wrap bracelet made with beads and crystals. I hadn’t figured out yet that the O-ring should be covered with hand painted silk. I like the addition of crystals on all the warp ends. 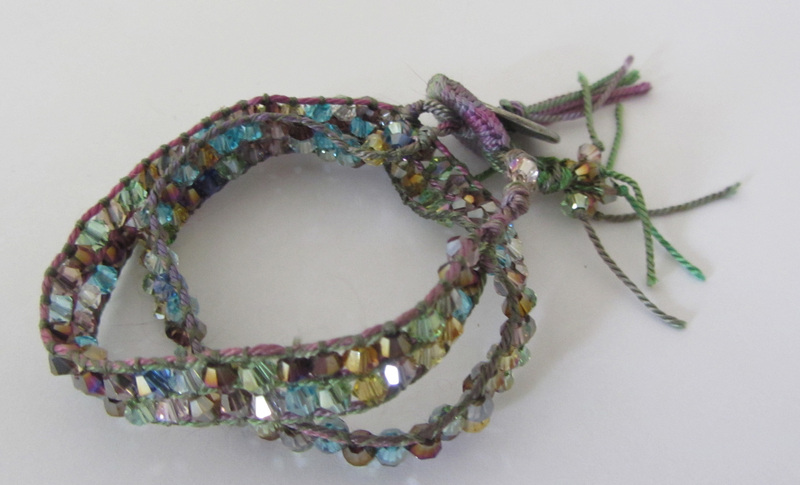 It was the start of something beautiful (the crystal and bead wrap bracelets that followed). Wow, this is an old one. The loom held four warps (which surround the square beads). 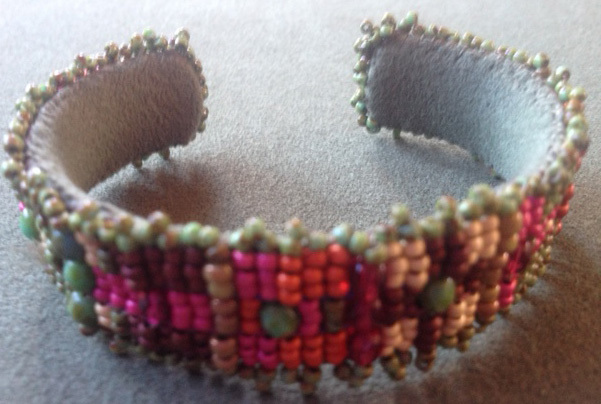 The trim on the ends (three size 11/0 beads) was put on as I wove. 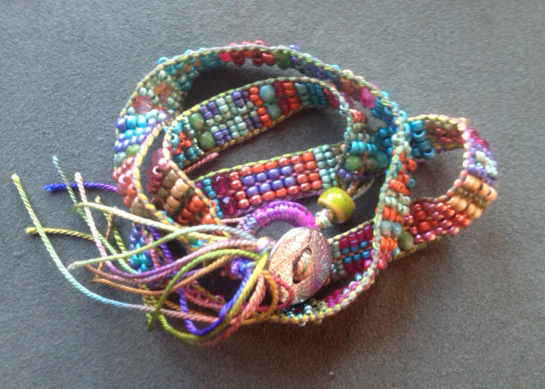 I then somehow crossed the interior beads, which are all strung at once. The warp was something fairly heavy like C-Lon beading cord 135. I don’t know why it never became a kit. Maybe it should! 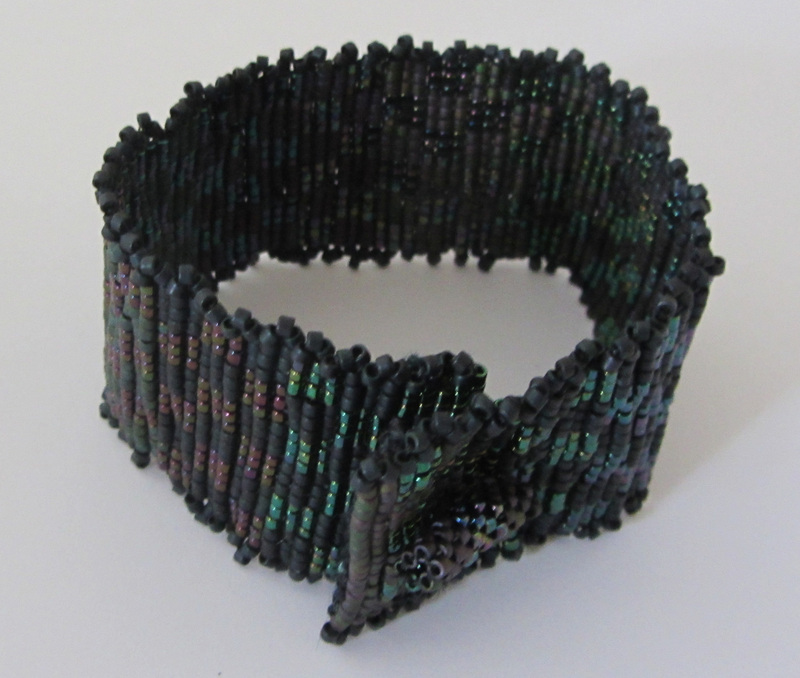 This bracelet is similar to the one above, but the inside rows are not crossed. 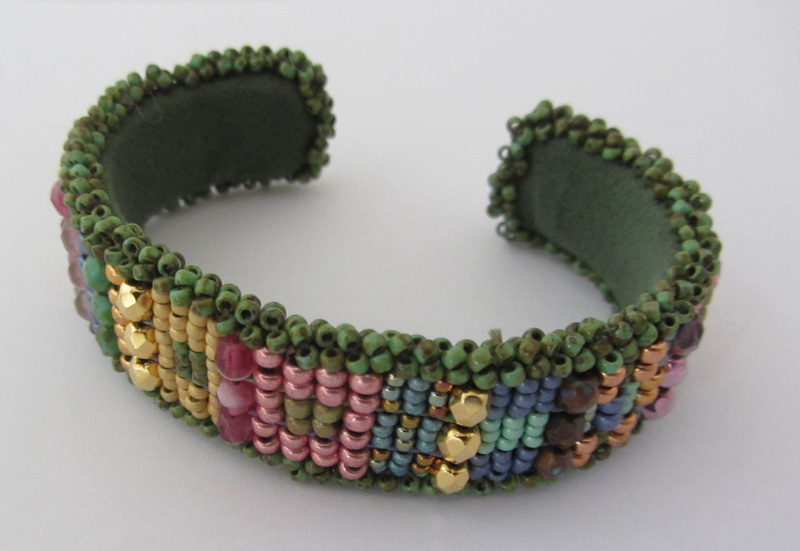 I had been making a bunch of bracelets to put on a brass cuff. But with this one I lined the back with ultra-suede (gets rid of all those pesky warp ends in a hurry plus is very comfortable to wear). 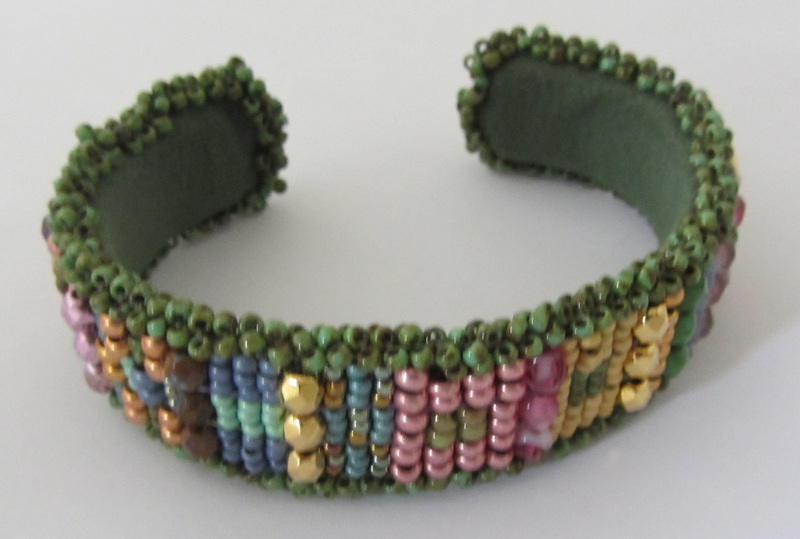 This next one is a variation of the affinity bracelet theme. This funny little guy uses a silk covered O-ring as both button and closure. I’ll try anything once. I might even try this again. You know how much I love checkerboards! 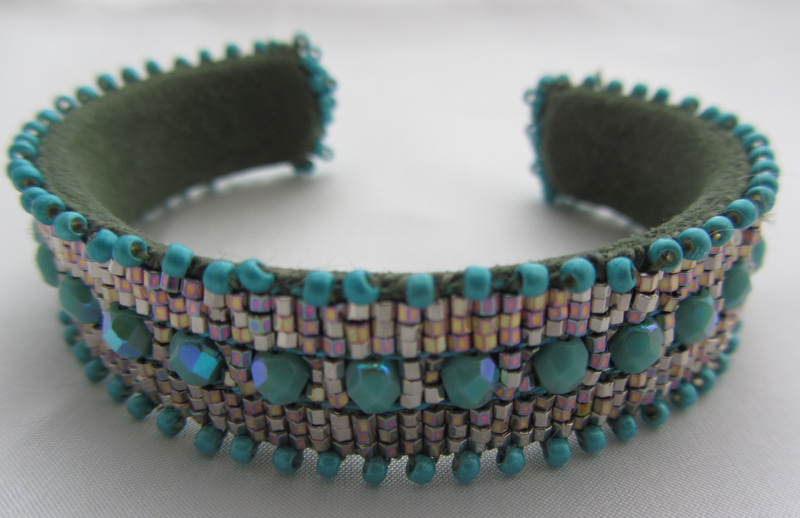 This is my latest bracelet (I made it yesterday) and it might want to become a kit. Bicone crystals on a hand painted silk warp. 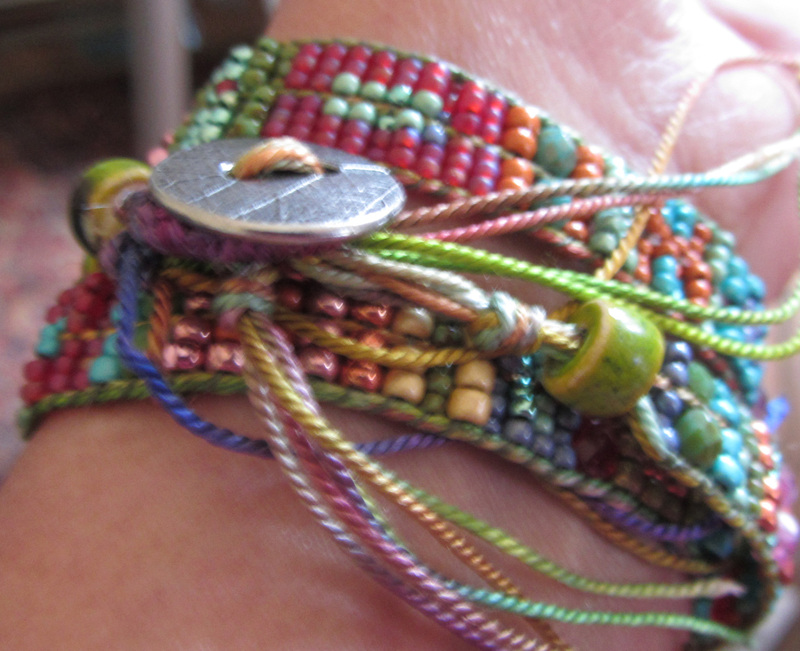 A few knots, a few more crystals, the usual hand painted silk covered O-ring (as well as warp) and pewter button. I think it took me an hour to weave and about twenty minutes to finish. Fun and easy. Should it become a kit? 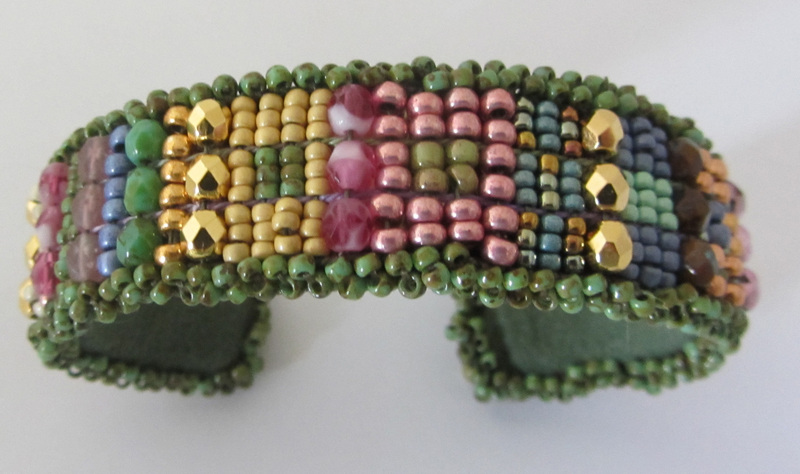 I decided to revisit the beaded cuff design and ramp down the number of colors as well as simplify the pattern. 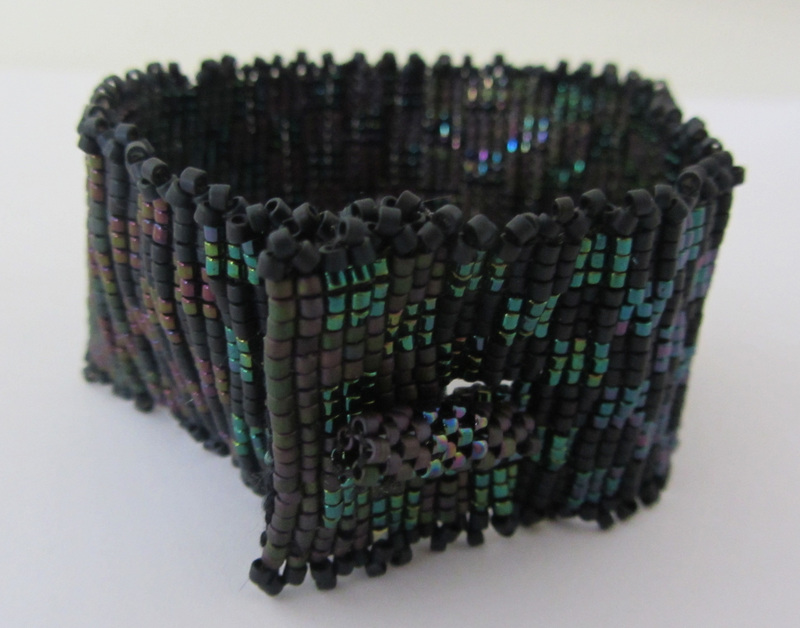 This is not quite as interesting to weave as a more colorful piece with several or more bead and crystal shapes, but still fun to weave and finish and I really like the final results. 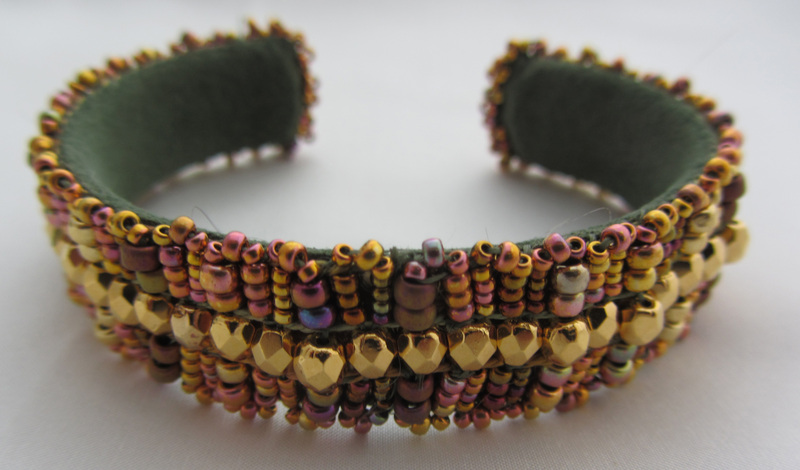 This one is made of gold finished beads only. Some are rose gold, some are iris gold, some are pink or yellow gold. The shapes are all round and the sizes range from 15/0 to 11/0 to 8/0. The fire polish crystals in the middle are 24 karat gold plated (and yes, they cost a fortune!). 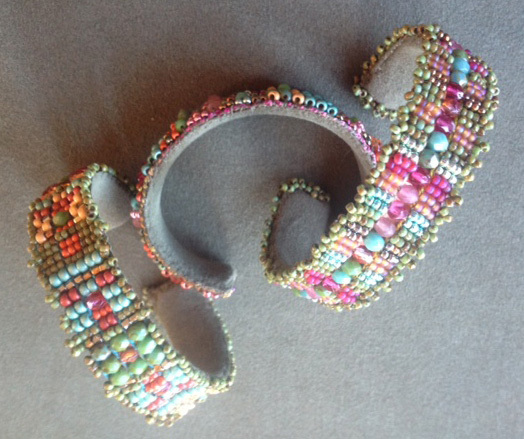 This piece combines rhodium plated size 11/0 Delica beads with fire polish crystals and size 11/0 beads for the sides. 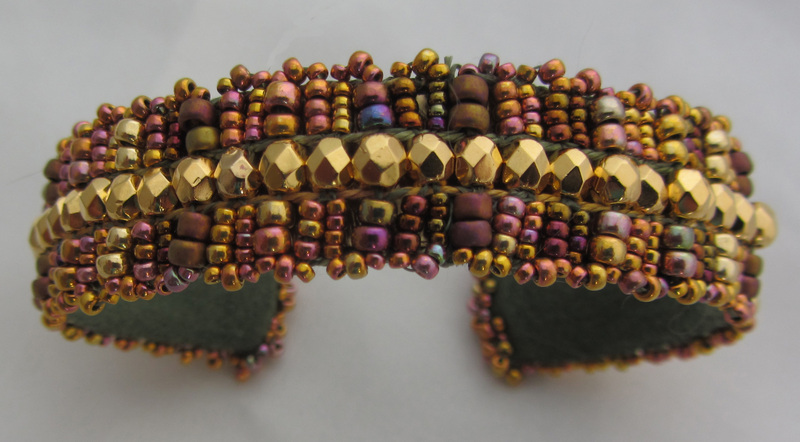 The last in the trip is again all gold but this time a combination of Delica beads in both rose and yellow gold finishes. 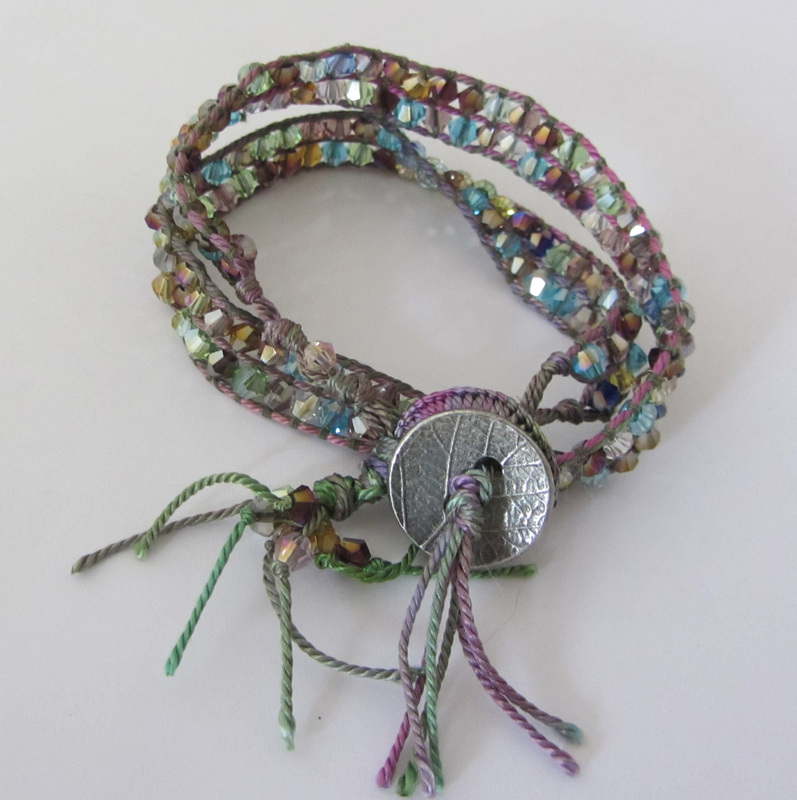 The crystals are swarovski in colors in the rose, purple, green range. 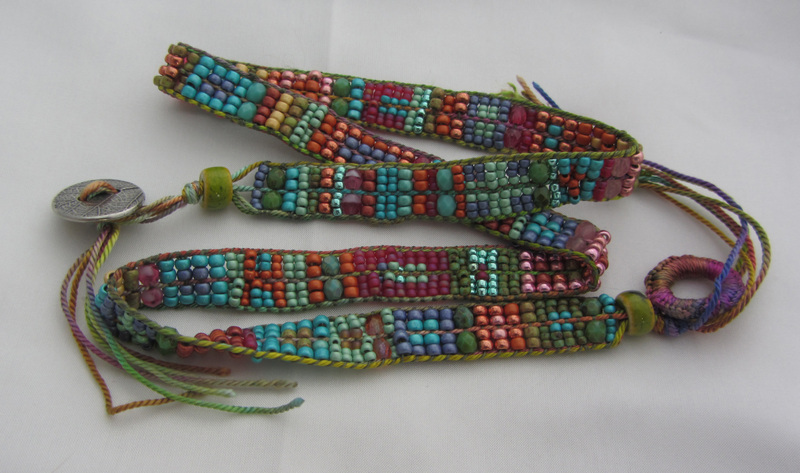 The trim beads are 11/0 and 15/0 round beads. 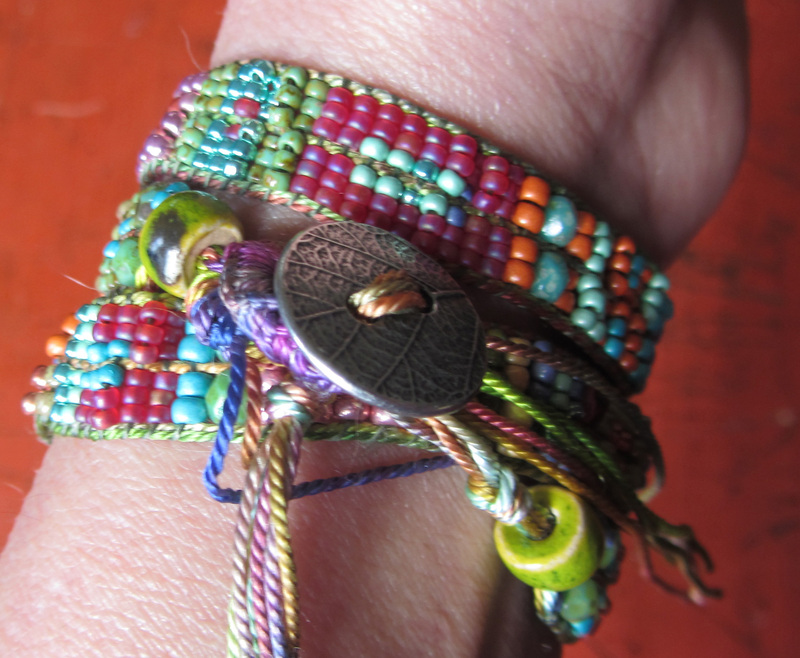 And lastly, the wrap bracelet revisited with pictures on an arm and spread out. I have been busy. I have been knocking off three of these a day. 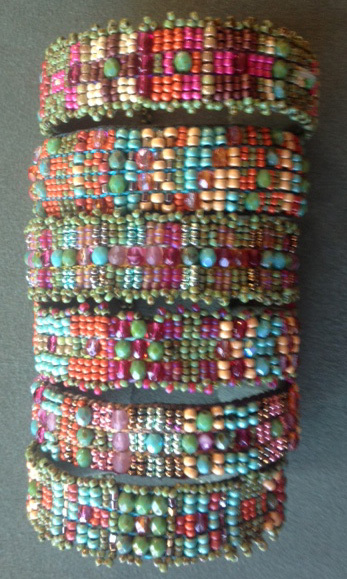 The thing I love about bead weaving (besides the fact that I love bead weaving) is that it is not hard on my hands. Eventually, every other craft I do starts to anger my hands and so I have to stop. 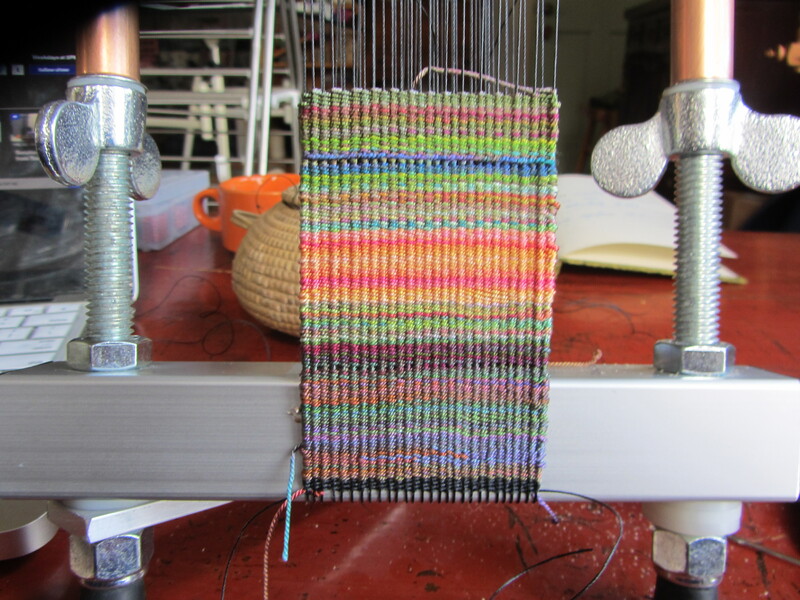 I can weave on a loom all day (with breaks of course to stretch, etc.) but my hands never get tired. 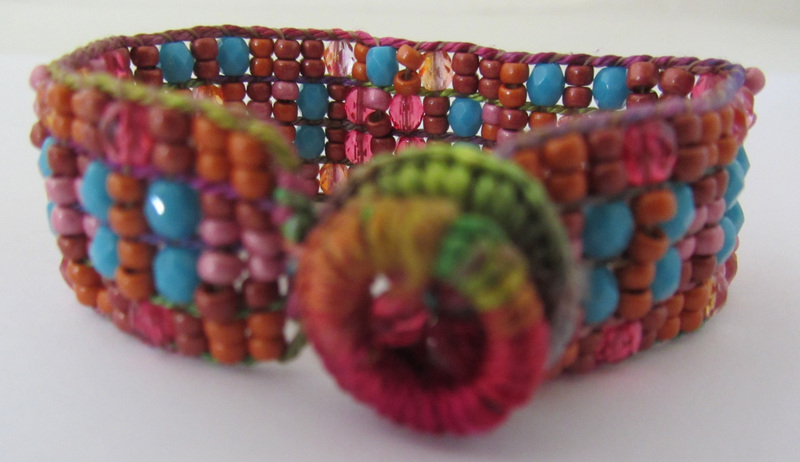 We plan to create an amazing kit that will include beads and basic instruction for a variety of cuff and wrap bracelets. I have run up the Mirrix credit card buying every bead and crystal I can find that I love and all these will go into the kit. So be watching for it. Meanwhile, some eye-candy to get you inspired! 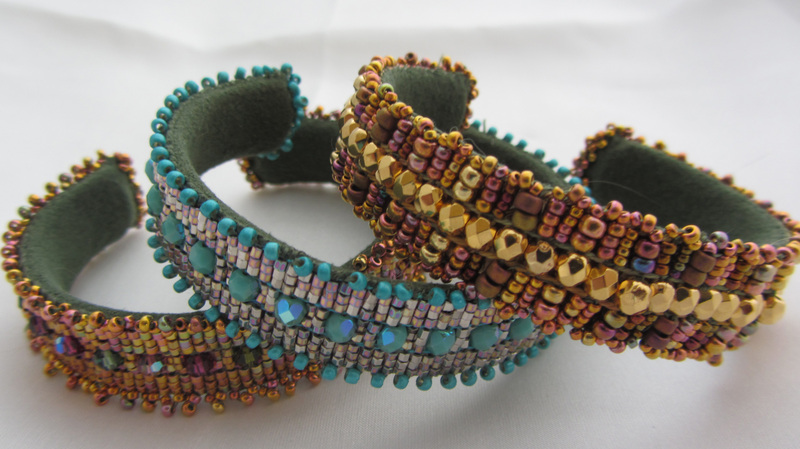 A stack of Cuffs: size 8/0 and 11/0 beads and 4mm fire polish crystals woven on a hand painted silk warp and attached to a brass cuff with an ultra-suede backing. 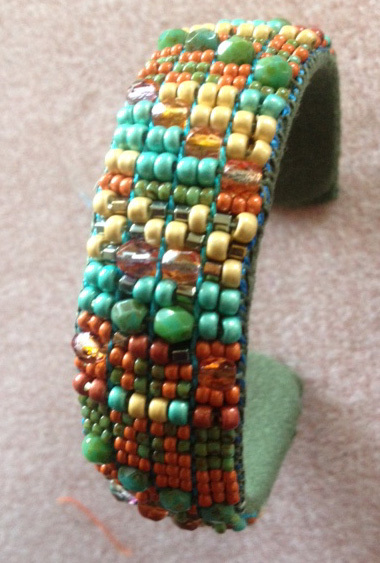 About twenty inches of beads and crystals woven on a hand painted warp with a button an o-ring finding. 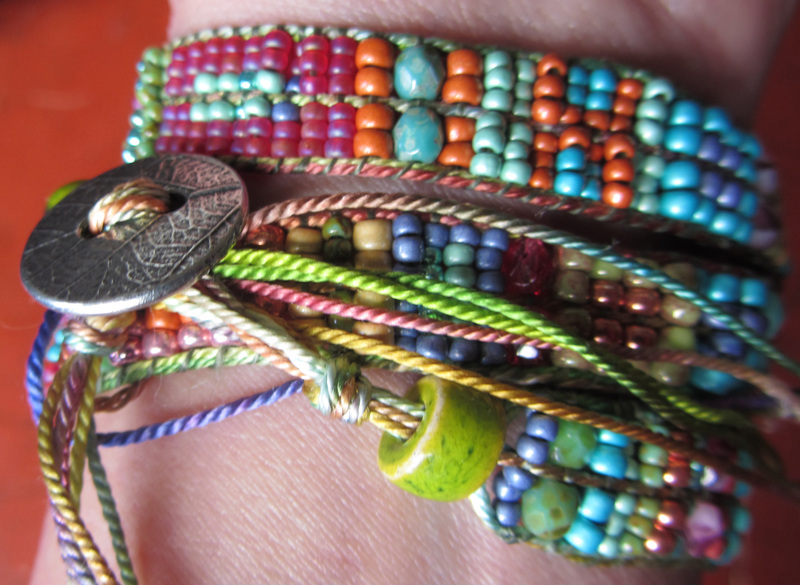 It wraps three times around your wrist. 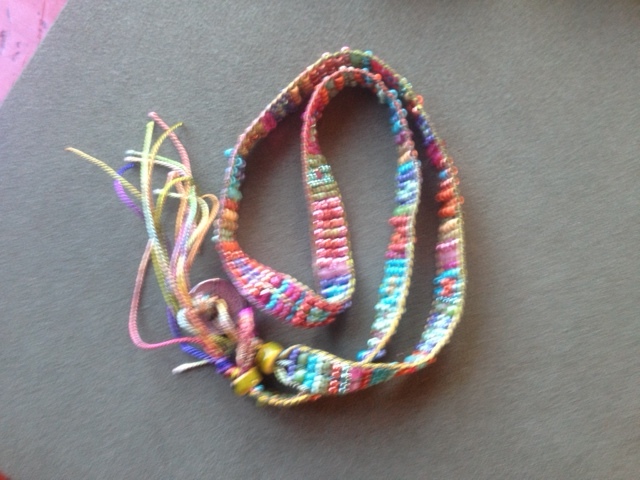 Fun to weave and easy to finish. Inspired me to order way too many beads for other color combinations and, of course, future kits. 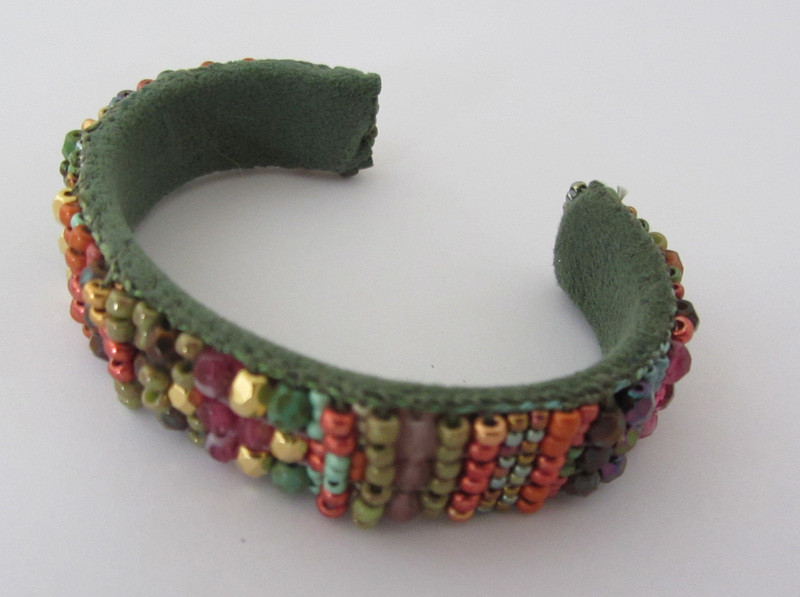 It’s attached to a brass cuff with an ultra-suede backing. 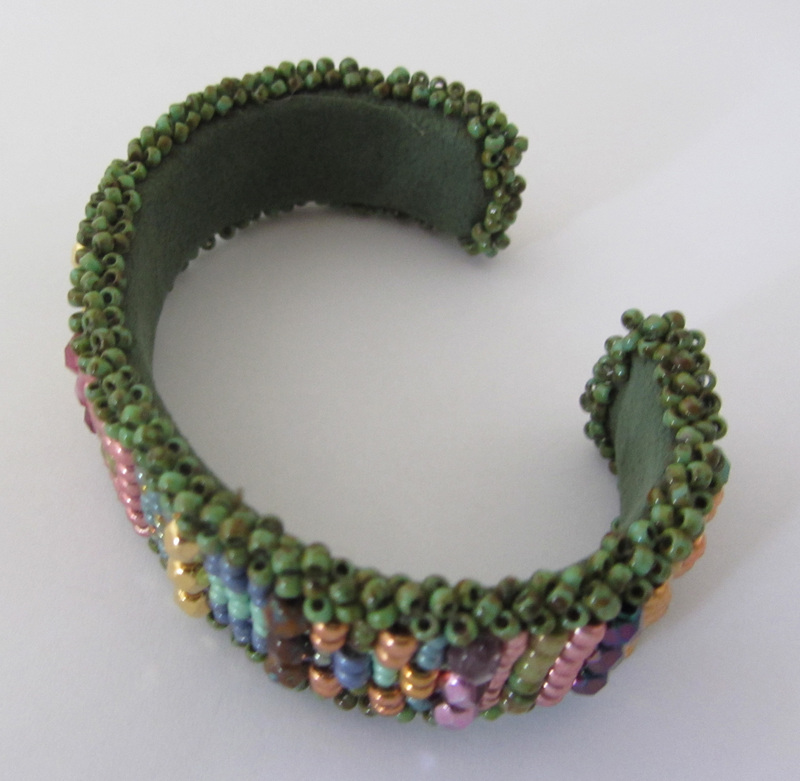 Similar bracelets but not on a brass cuff and backed with ultra-suede with a pewter button and a silk covered o-ring for closure. This is not about weaving. 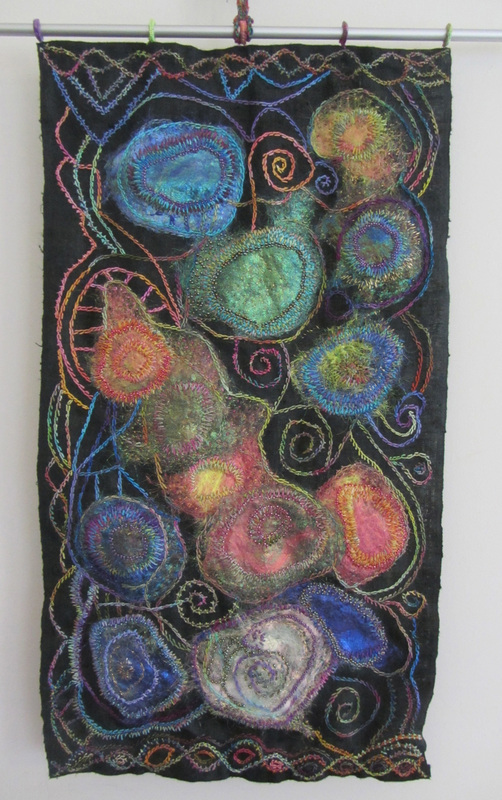 This is about embroidery, which I decided to learn how to do because I wanted another way to play with my hand painted silk yarn. I can only do so much embroidery. 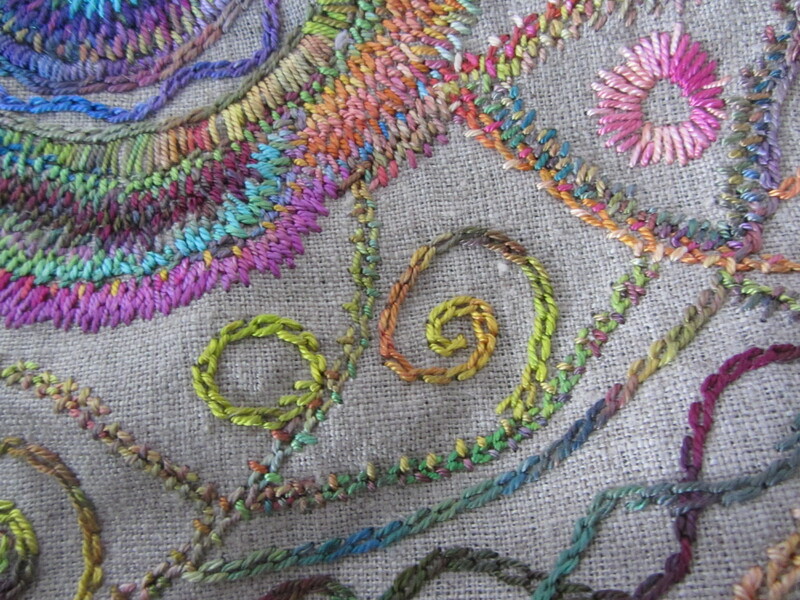 Weaving is gentle on my hands but embroidery seems to anger them after an hour or so. It’s mainly my left hand. My thumb has to grasp the cloth (maybe I need one of those wooden frames that hold the cloth?) and it doesn’t like it. 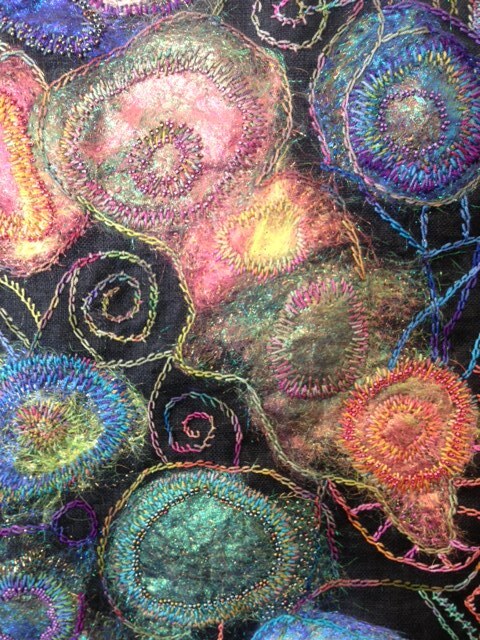 I am thinking I might combine the embroidery with weaving. For example, doing embroidery on a weaving. You don’t see much of that. 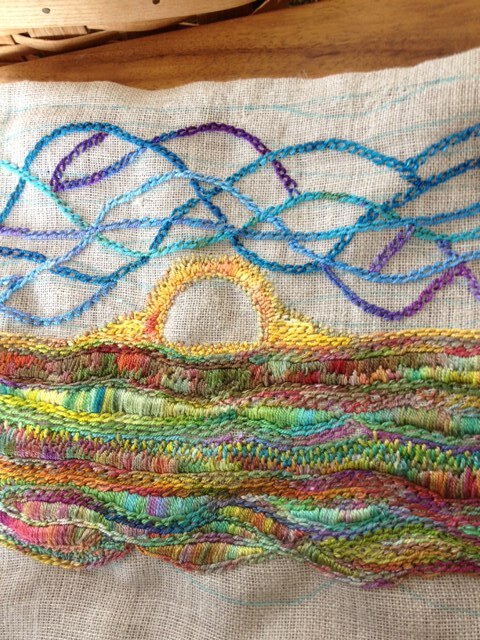 Once in a while a tapestry weaver will add some embroidery to achieve, for example, a thin vertical line without having to weave double weft interlock, which can be a real pain. I am sure there are other examples of embroidery on tapestry, but it’s not that common. That will be my next adventure. I thought I would show you a sneak preview of two unfinished works. 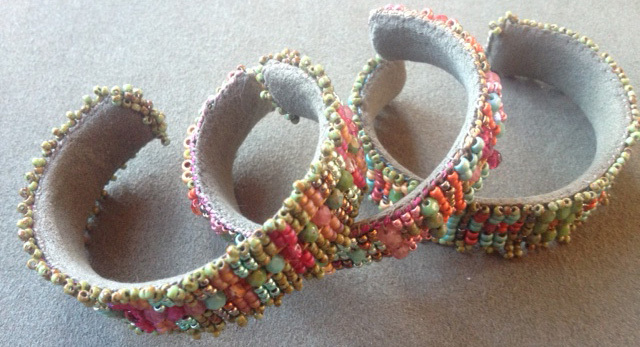 The first two (almost full photo and close up): It’s a combination of angelina fiber, hand painted silk yarn and beads. It took a long time and it’s not finished. 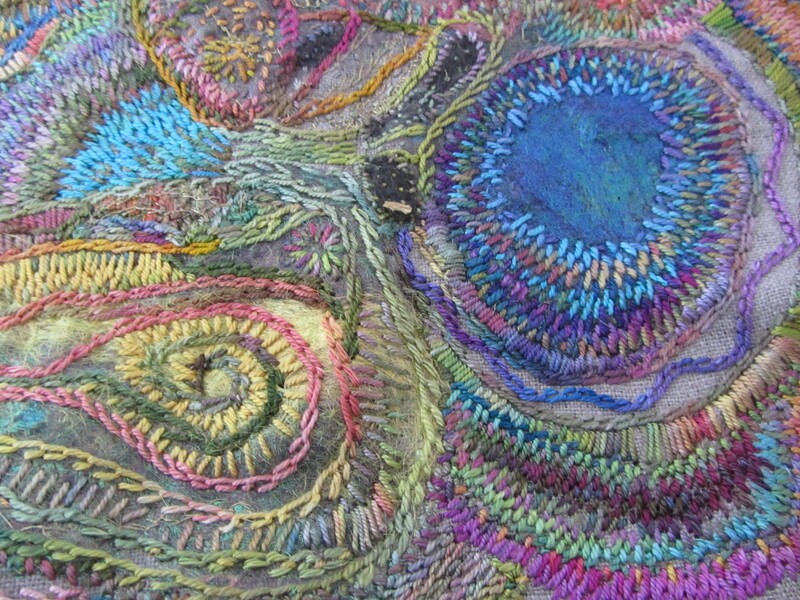 The swirls around the solid areas need to be finished. 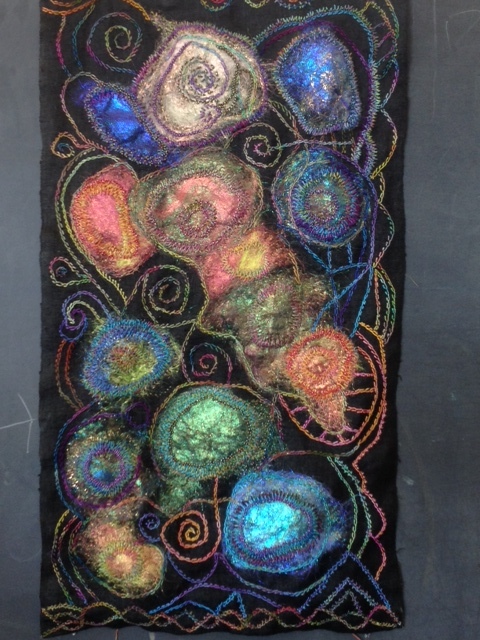 I embroidered it on black hemp cloth. The last one is done on linen cloth with just hand painted silk. I plan to completely fill the cloth. It is a long way from being finished. 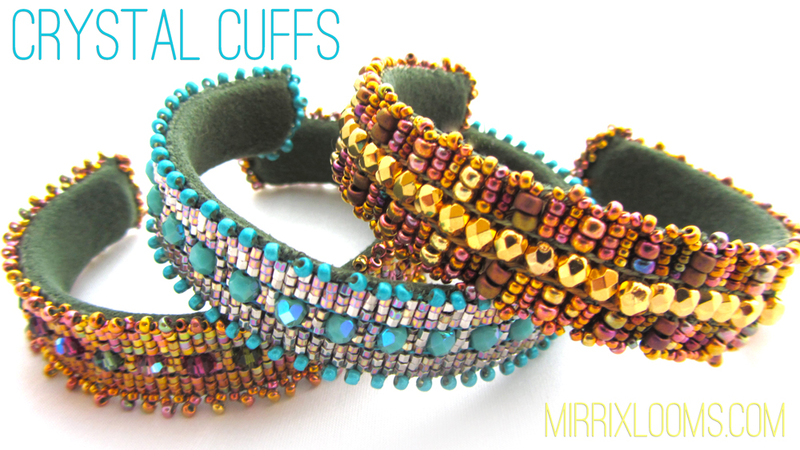 In a few days we will be launching the first of our free patterns to the Mirrix Website. 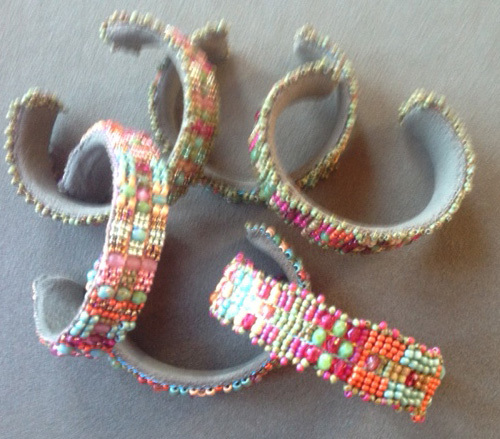 You get a sneak preview of the first three bracelet patterns. In the works: cellphone case, small purse and whatever else I (Claudia) can come up with. So keep me inspired and download these totally free patterns. 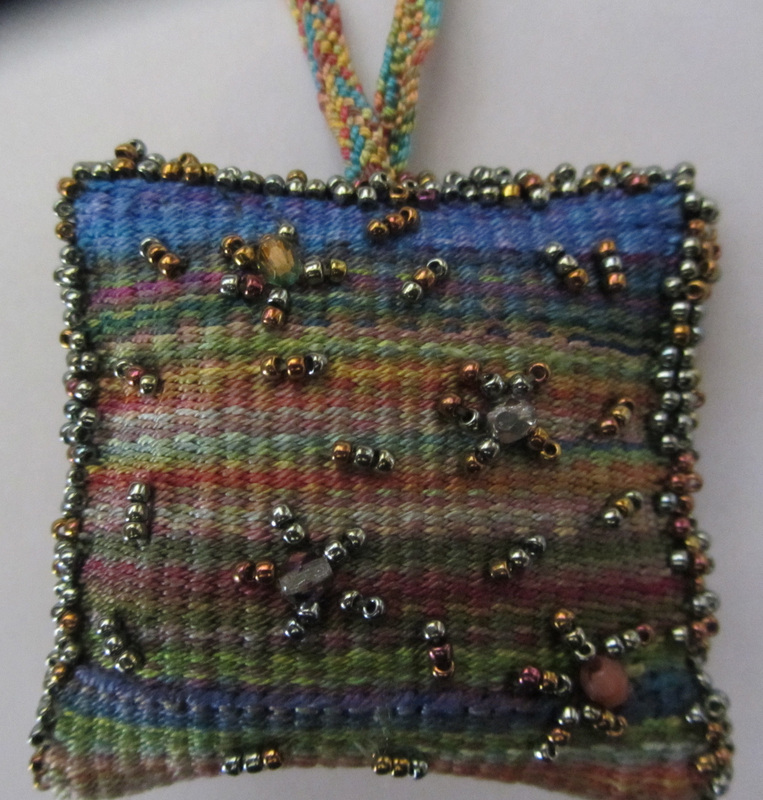 And then send up pictures of your weavings, if you’d like, so we can share them with the rest of the Mirrix family.